I found this fascinating. 1920s sarcasm, too. The decision to strike followed ineffectual attempts to adjust a dispute enused by the announcement of the Meat Packers' Association of New York that frankfurter men's wages would be reduced from $44 to $41 a week to $37 and $34 and their hours increased from eight hours a day to ten....The meat packers insisted that they and the hot dog could survive only if hours were lengthened and pay rolls shortened. 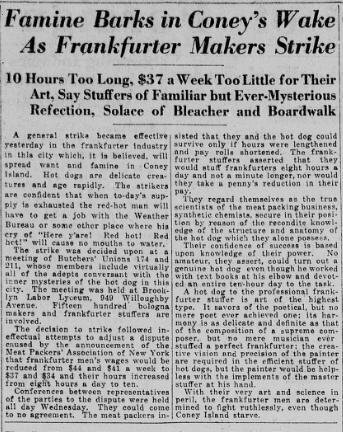 The frankfurter stuffers asserted that they would stuff frankfurters eight hours a day and not a minute longer, nor would they take a penny's reduction in their pay. They regard themselves as the true scientists of the meat packing business, synthetic chemists, secure in their position by reason of the recondite knowledge of the structure and anatomy of the hot dog which they alone possess. Their confidence of success is based upon knowledge of their power. No amateur, they assert, could turn out a genuine hot dog even though he worked with text books at his elbow and devoted an entire ten-hour day to the task. A hot dog to the professional frankfurter stuffer is art of the highest type. It savors of the poetical, but no mere poet ever achieved one; its harmony is as delicate and definite as that of the composition of a supreme composer, but no mere musician ever stuffed a perfect frankfurter; the creative vision and precision of the painter are required in the efficient stuffer of hot dogs, but the painter would be helpless with the implements of the master stuffer at his hand. With their very art and science in peril, the frankfurter men are determined to fight ruthlessly, even though Coney Island starve. To be sure, there was the usual number of children lost only to be found by frantic mothers, but Coney Island is one place where children simply will get lost--and found. The hot dog bazars fooled every one and went about selling their wares as if there was never such a thing pending as a scarcity of woofers due to the strike of the aroused frankfurter makers. At one booth alone it was estimated that 35,000 pounds of frankfurters were sold during the day. The keen-sighted venders (sic) had laid in an extra large supply to carry them over any emergency. Whether they will have anything in that line to sell next Sunday is something to be worried about next Sunday. So if it had not been that a dapper young man, introducing himself by the odd yet serviceable name of John Smith made off with Miss Mary Frimerman's engagement ring and other jewelry and money amounting to $1,000, the day as it fell upon Coney Island would have been perfect. It was Miss Rose Frimerman who met Mr. Smith yesterday in a restaurant. She had never seen him before, it is said, but his manner while offering to pay her check was so irreproachable that she took him around to the house and introduced him to Mary and Joseph Yacker, Mary's fiancé. Mr. Smith, unfortunately, did not have a bathing suit, so when the others decided to saunter over to the beach for a dip, he departed. Before starting for the water Rose and Mary put their rings and money in a beaded bag and hid the receptacle in one of the rooms. Seventy-four dollars belonging to Yacker also was put in the bag. Then they went out. What prompted Rose to worry about the safety of the bag is not known. But she did, and returned to find Mr. Smith in the room. "Oh, hello," she said. "What are you doing here?" Mr. Smith blushed modestly while he explained that he had a few pounds of unnecessary sand in his shoes and had come in to get rid of it. That was all there was to that. Mr. Smith left once more, and when Rose looked for the bag it was gone. She was able, however, to give a good description of him to the police. ...Frankfurter sandwiches, popular with those who patronize quick lunches, cost an average of 2 4-10 cents, including mustard, and usually sell for 10 cents, the report said.